But there are all sorts of fallout effects — politically, legally and electorally — to contemplate over the coming days and weeks. Renzi’s political position remains difficult — and Berlusconi knows it. Right now, the Democratic Party is split between its leader (Renzi) and a prime minister (Letta), and Berlusconi is masterfully playing Renzi and Letta off one other. As long ago as November 2012, when Renzi unsuccessfully challenged Bersani to lead the centrosinistra, Berlusconi has long indicated he prefers Renzi, both because of Renzi’s project to pull the Democratic Party far from its leftist roots and because Renzi’s populism resembles Berlusconi’s political approach for the past two decades. It escaped no one’s attention that Berlusconi came to Renzi at the Democratic Party’s headquarters on Saturday to discuss the details — a sign of massive respect from a figure who still dominated Italy’s politics. If Conservative prime minister David Cameron’s polish earned him the moniker as ‘heir to Blair,’ Renzi is must as much heir to Berlusconi. But the longer the Renzi/Letta tension endures, the harder it is for Renzi both to remain a loyal PD leader and retain his ‘energetic,’ populist edge. That means elections sooner rather than later, so long as Renzi can’t be blamed for pulling the cord on Letta’s government prematurely. But in a world where Berlusconi yanked his support from Letta’s government over a mere 1% sales tax hike, it’s difficult to take seriously the notion that Berlusconi would ever back Renzi’s call for major economic reforms. For the record, none of Berlusconi’s previous governments prioritized the kind of reforms that Italy desperately needs to become more competitive. Instead, there’s a sense that the wily Berlusconi sees this deal as a vehicle to split the Italian left and to give the Italian right another chance to retake power (a goal that Berlusconi, incredibly, almost achieved in February 2013). That would mean Berlusconi’s return to power, even if Alfano or another Berlusconi ally, such as his daughter Marina, becomes prime minister. If the Italian right controlled government again, it could easily ameliorate the worst effects of both Berlusconi’s conviction and his ban on holding public office. 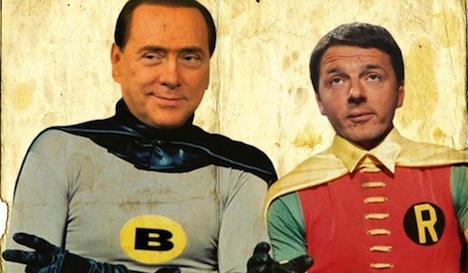 The Renzi-Berlusconi election deal could still be unconstitutional. There’s still a significant chance that the constitutional court won’t find this electoral law up to par either. The concept of a parliamentary ‘runoff’ obviously tries to address the constitutional court’s ruling, which termed Italy’s current election law ‘manifestly unreasonable.’ In a runoff scenario, the leading party would be able to point to a mandate from the majority of the Italian electorate, thereby making the ‘winner’s bonus’ somewhat more representative. But that’s not necessarily what could happen. For instance, take the latest January 17 SWG poll, which finds that the centrosinistra would win 37.2% of the vote, the centrodestra would win 34.0% and the Five Star Movement would win 19.9%. That means that the centrosinistra would win a first-round victory and still hold many more seats in the Chamber of Deputies than its share of the national vote. The parties supported by the remaining 62.8% of at least this hypothetical Italian electorate would be stuck with 46% or 47% of the remaining parliamentary seats. Moreover, the court heavily criticized the closed-list system, and the Renzi-Berlusconi deal perpetuates that aspect of Italian election law. A war on the Italian left. For all of the awkwardness of the political dance between Renzi and Letta, they both largely support the push for reform. But there are plenty of powerful voices within the party that oppose the budget austerity of the Monti-Letta governments as well as wide-ranging economic reforms. That’s one reason why Stefano Fassina resigned earlier this month as deputy minister of finance, in direct repudiation of Renzi, and why Gianni Cuperlo has now stepped down as the (largely ceremonial) president of the Democratic Party. Despite the margin of Renzi’s PD leadership victory, it’s hard to believe that the Italian left has wholly embraced him just two years after they overwhelmingly chose Bersani over Renzi. The young leader also faces a delicate balance in criticizing Letta’s government — he risks being seen as putting ambition over a functioning government. The Democratic Party, in its current format, was created only seven years ago, and it pulls together former communists, former Christian Democrats, trade unionists, social democrats, Renzi-style reformists and Letta-style technocrats, among others. It remains a faction-ridden, multi-headed hydra. There’s nothing predestined about its perpetual unity, and Renzi risks fracturing the party if he pushes Fassina, Cuperlo and other leftists to form a competing party (perhaps a merger with a handful of other communist and leftist parties that could command a small, if significant, share of the vote). Whither Grillo? In some ways, the Renzi-Berlusconi deal also seems incredibly reactionary. It’s as if Renzi and Berlusconi tried to craft a system that would essentially minimize the impact of the Five Star Movement and prevent it from holding any real power. If the results of the 2013 election were replicated under the proposed system, the centrosinistra wins 29.5%, the centrodestra wins 29.1%, and the Five Star Movement wins 25.5%, the runoff would exclude Grillo’s protest movement entirely. If Grillo convinces voters that the latest electoral law amounts to a stitch-up among the same old corrupt actors in Italian politics on both the left and the right, it could give his flagging movement new momentum. Not surprisingly, the Five Star Movement’s leaders have come out strongly against the deal. The deal could make Italy’s political system much more presidential. Throughout the world’s various electoral systems, it’s odd to see a runoff for a proportional representation-style parliamentary system. The closest analog might be Australia, where everyone essential discounts the initial vote and looks to the automatic two-party preferred vote. The runoff would feel incredibly ‘presidential,’ pitting the leaders of the centrodestra and centrosinistra against one another directly (especially in a closed-list system). But Australia, unlike Italy, has had an entrenched two-party tradition for the past century. Though you can trace the Italian left and the Italian right to the Italian civil war of the mid-1940s, and though the ‘first republic’ largely pitted the liberal-conservative Christian Democratic tradition against the Communist tradition, Italian party politics have been much more fluid. That makes future political outcomes more uncertain. A system of parties or a system of coalitions? Another looming question is how the proposed election law might affect the state of Italian parties vis-à-vis the broad centrodestra and centrosinistra coalitions, which have dominated the ‘second republic’ since the mid-1990s. The centrosinistra coalition that contested the 2013 elections amounts to a partnership between the Democratic Party and Puglia regional president Nichy Vendola’s democratic socialist Sinistra Ecologia Libertà (SEL, Left Ecology Freedom). SEL preferred in May 2013 to enter the opposition over joining Letta’s government, and there’s little love lost between Renzi and Vendola. Though there’s more than a hint that the Alfano/Berlusconi split is symbiotically strategic (it hedges the Italian right by giving it voices in both government and opposition), the centrodestra also includes a handful of far-right parties and the autonomist Lega Nord (LN, Northern League). Like SEL on the left, the Lega is currently in opposition. What’s more, the Lega has traditionally been a thorn in past Berlusconi governments, and it brought Berlusconi’s first 1994-95 government down within nine months. A minimum threshold will continue to give smaller parties incentives to join broader coalitions. But it might be tempting for Forza Italia and the Democratic Party to go it alone under the proposed system. Both Renzi and Berlusconi probably believe that they can make it into the runoff on the strength of their own parties (even if Grillo somehow takes the second spot, not impossible). On the basis of parties (and not coalitions), the same January 17 SWG poll shows that the Democratic Party leads with 32.4%, Forza Italia wins 20.8%, the Five Star Movement still wins 19.9%, the Lega wins just 5.2%, Vendola’s SEL wins 3.9% and Alfano’s NCD wins 3.8%. That means that if the thresholds were high enough, the Lega, SEL and the NCD might all lose their seats under the proposed law, not to mention the smaller centrist parties that banded together with Monti and Christian democratic leader Pier Ferdinando Cassini in the last election. Photo graphic credit to Vanity Fair Italy. Previous PostHollande’s economic restart falls flat amid domestic dramaNext PostCould the United States and Canada effect a national merger? I waas recommended ths blog by my cousin. I’m not sure whether this post is writtrn by him as no one els know such detailed about myy trouble.